Come celebrate another fantastic year of Masmid Torah learning, at our tenth annual end-of-year Masmid Banquet. 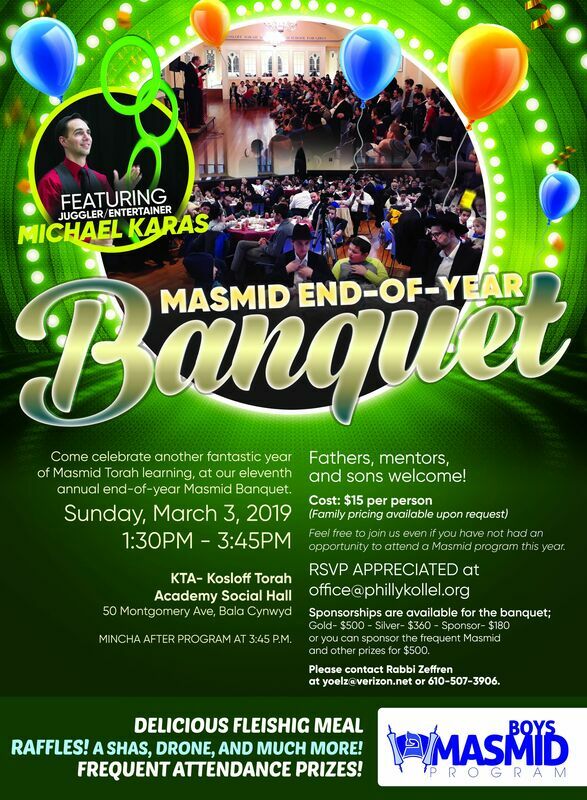 Sunday, March 3, 2019 1:30 PM-3:45 PM at KTA- Kosloff Torah Academy Social Hall, 50 Montgomery Ave, Bala Cynwyd. Mincha after program at 3:45 p.m.
Mincha after the program at 3:45 p.m.
1:30 PM: Banquet program begins- sign in and get your raffle tickets. 1:40 PM: Full dinner meal with hot dogs, hamburgers (veggie burgers available with RSVP), fries, special dessert and more. 2:30 PM: Spectacular Presentation with the award-winning juggler *Michael Karas!! Fathers, mentors, and sons welcome!